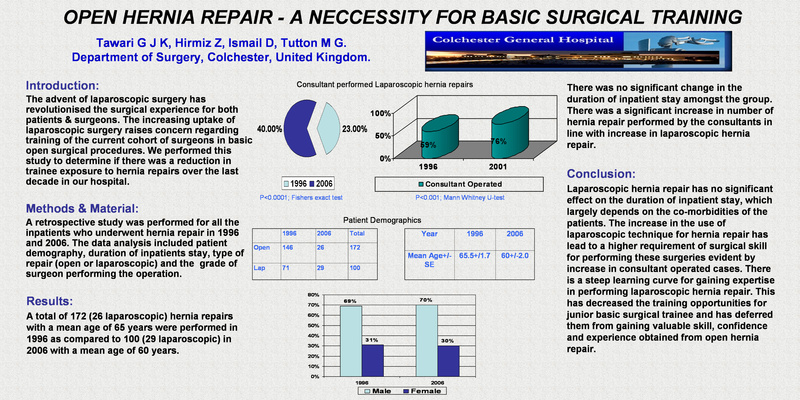 With the increasing uptake of laparoscopic hernia repairs, there could be concern that the availability of this basic open training procedure will be less for the current cohort of trainees as consultants and experienced registrars are doing more hernia repairs laparoscopically. This study aimed to determine whether there was a reduction in trainee exposure to hernia repairs over a ten year period at a busy district general hospital. A retrospective study was performed of all patients undergoing inpatient hernia repair by a laparoscopic or open approach in both 1996 and 2006. Data analysed included: patient demographics, grade of supervising surgeon and duration of inpatient stay.